I recently purchased a Roker Ultra Mini Bluetooth USB Adaptor and a Roker®Sound Cube Wireless Speaker. I'm installing/using these products on a Dell Latitiude D600 laptop, which is running Windows XP Professional. This follows from a somewhat unsatisfactory experience using Bluetooth with a HDMX Jam Classic wireless speaker previously. This is my first (well, technically second) experience working with Bluetooth, and I was able to install the USB Adaptor/Bluetooth device (and software) and have been able to pair the Sound Cube successfully. However, no audio, from any source on my laptop, seems to be being routed to the Sound Cube. The Sound Cube is turned on, is fully-charged, and generates the standard "audio message" when turned on and works using the auxilliary cable connector. So, the Sound Cube is working, as is the adaptor. 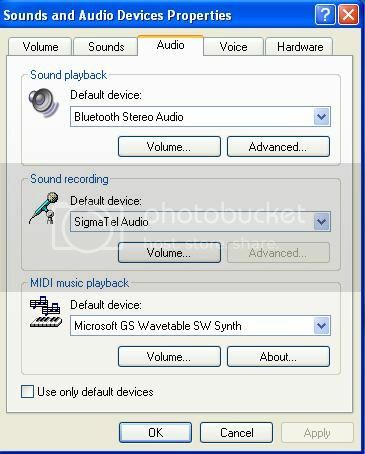 I know the adaptor was described to be compatible with Windows XP, but maybe I simply do not know/understand enough about Bluetooth to know how to route audio from my laptop to the Sound Cube - but it must not be that difficult, and I thought it actually happened automatically, but perhaps not. Any specific help or guidance on this from anyone? The initial posting was actually something of a “red herring”, since while I was looking for a solution to this question, mostly in connection with a prior similar posting, I had actually planned to use this as a springboard to a follow-up, since I had managed to solve the problem on my own – but figured there had to be others out there who were “drifting” and looking for an answer, so I figured I’d take the time to offer a solution that worked for me. Just to recap, this was a situation where I wanted to install Bluetooth capability on an older laptop running Windows XP Professional, but which lacked a Bluetooth OEM card module. After my bad initial experience, I took a chance on a Roker Sound Cube, with a compatible Roker USB Bluetooth 4.0 dongle. Since virtually all Bluetooth devices run the proprietary CSR (Cambridge Silicon Radio) protocol, I found it was advisable to make sure to purchase a Bluetooth dongle which included the mini-CD installation disk, since there are so many darned Bluetooth device drivers available, it’s hard to know which one is right and compatible with your particular USB hardware. For me, the software installation was pretty straight forward, as was plugging in the USB dongle (you just plug it in, of course . . .). From what I could see, the Bluetooth Settings and Bluetooth Devices icons were both successfully added to the Control Panel. 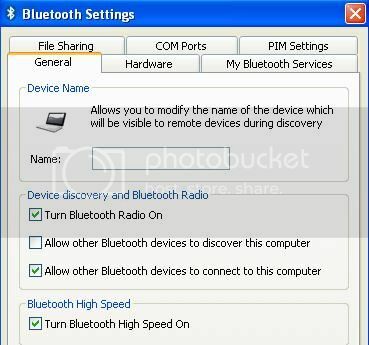 The configuration of the Bluetooth Settings interface also all looked right (especially important is to toggle the Bluetooth radio checkbox). 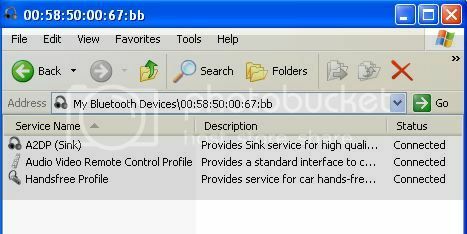 I also noted that on the Control Panel, under Sounds and Audio devices, that the Bluetooth software had automatically installed the Bluetooth Stereo Audio, and set that as the default device. From the Bluetooth Devices interface, I had no trouble detecting and then adding my device, the Roker Sound Cube. From there I had a little trouble establishing actual Bluetooth connection, as both the Bluetooth dongle and the Sound Cube itself came with little or any really helpful instructions (guess it was all supposed to be intuitively straight-forward). It wasn’t. After adding the device, you need to right-click (or double-click) on the device to review the available services. From that interface you can select and open your services by double-clicking, which will typically establish the connections via the Bluetooth radio, automatically. Likewise, you can disconnect by right-clicking, and selecting Disconnect, and you can Remove the devices from the Device interface by right-clicking also. At that point you should be able to detect sound from the device. I noticed that audio output from my Internet browsers, plus most of my multi-media devices (Window Media Player, VLC Media Player, etc.) all seemed to work fine, although output from my Audacity application, couldn’t be coaxed to direct audio output to the Roker Sound Cube. Not sure what the story was with that, but if others have a suggestion on that score specifically, I’d be interested in hearing it. Well, hopefully this will be of some help to others.